Part of the fun of raising and caring for a child is the opportunity to introduce that kid to the wonders of the world — the world of food, that is. As a baby’s taste buds transform into a toddler’s picky palate and then the (often sugar-loving) cravings of a full-size kiddo, it becomes even more important to ensure healthy choices are readily available. And thanks to ever-rotating seasonal crops, each month presents a new slew of vegetables, fruits and grains to sneak into recipes, lunchboxes and snacks alike. It’s not a competition, but if it were, fall would definitely be the seasonal produce winner here. So consider this your and kiddo’s end-of-fall shopping list, broken down by age. When brainstorming the best dishes for babies who are still learning the (intricate) ropes of how to chew solid foods, registered dietitian Natalie Rizzo says to be mindful of the shapes, textures and preparations of your recipes. When in doubt, she says, opt for mashed or soft foods that don’t risk a choking hazard. Some of the superstars of the autumn season — pumpkin, sweet potato and cauliflower — are ideal for a warm, hearty baby food mix that will be both sweet and savory on baby’s impressionable taste buds. “The orange fruits and veggies are rich in vitamin A and beta-carotene, which are vital for a child’s eyesight development,” Rizzo explains. As an added bonus, Rizzo says these veggies are packed with fiber, helping to alleviate the frequent constipation symptoms that many babies battle. This is another easy-to-slurp-and-digest favorite. Swinney suggests whipping it up as a meal for the whole family. Because this soup is filled with vitamin E, thiamin, niacin, vitamin B6 and magnesium, it benefits growing minds as well as bodies. For flavor, Swinney says to “just add sautéed onion or shallot, applesauce and some chicken broth and milk.” But if you’re serving a mini portion for baby, make sure to set that bit aside before you add the salt and milk to ensure it’s easy on his or her stomach, Swinney notes. Remember the last time your sweet (and finicky) toddler cleaned their plate? I can’t either. Rizzo says during this stage of development, you’ll have better luck fixing up on-the-go bites, since toddlers gravitate toward finger foods — and are hard-pressed to sit down for a whole meal. Not only does roasting various flavors together make your home smell delicious, but these soft and warm nibbles might also be the easiest way to get your toddler to try the healthy staples of fall. 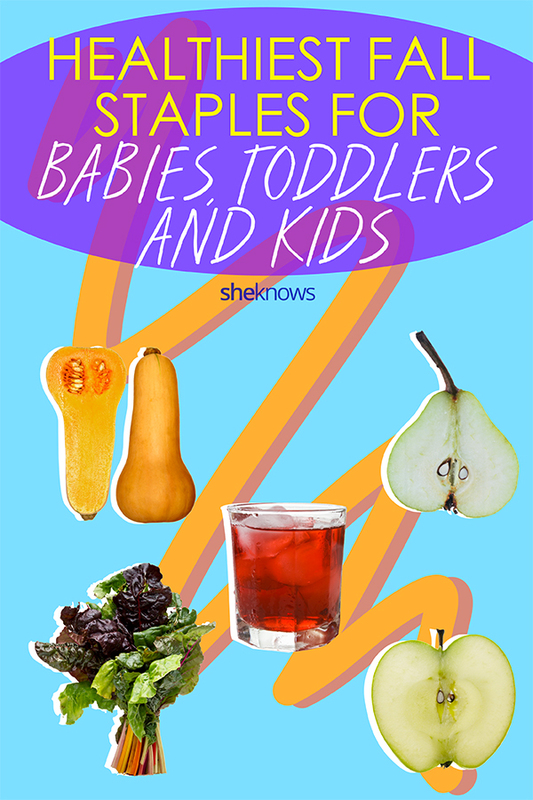 “Apple and pear slices and roasted sweet potato cubes work well for kids of this age. Sweet potatoes have vitamin A for developing eyes, and apples and pears are full of fiber and phytochemicals,” Rizzo says. For protein and calcium that promote muscle growth and bone health, try sneaking in a few spoonfuls of yogurt too. Though your tot probably loves ice cream, for a healthier fall treat, Swinney suggests a slightly sweetened squash of the season. “Acorn squash is a fun treat for toddlers because they can eat it right out of the skin. Just microwave it and top it with a little butter and cinnamon-sugar. Or you can slice it and roast in the oven; they might even enjoy eating a slice with their hands, like an apple,” she shares. With its short life cycle, the pomegranate might send you on a scavenger hunt for a ripe one. If you succeed, make fizzy pomegranate juice for a healthy take on soda that will please plenty of sweet-toothed toddlers, Swinney suggests. Just juice the pomegranate seeds and add club soda for a delicious beverage in less than a minute — or use the seeds as a topping over brown rice for an unusual side dish. Are you witnessing the fascinating transformation of your children turning into mini-adults? Complete with personalities and preferences galore, older kids can be tricky to entice toward healthy eating; after all, they can think for themselves. This just means you’ll need to get craftier. Move aside, potato chips. With apple harvest in full swing, slice and top the fruits with coconut oil and the tiniest bit of sugar for an afternoon snack kids will run from the school bus to sample. If you’ve skimmed over Swiss chard in the produce section thinking, “There’s no way they’ll eat that,” you’re not the only one. Swinney says many people don’t take advantage of this fall food, which is a cousin of spinach and beets. But give it a chance: Swiss chard is super-nutritious and ideal for smoothie or soup fans. “Even kids will enjoy a green smoothie with Swiss chard, pineapple and berries. Or since fall is soup time, Swiss chard makes a wonderful blended soup when combined with potatoes, spices and a bit of cheese,” Swinney says. More: What is Food Therapy, & Does My Child Need It? 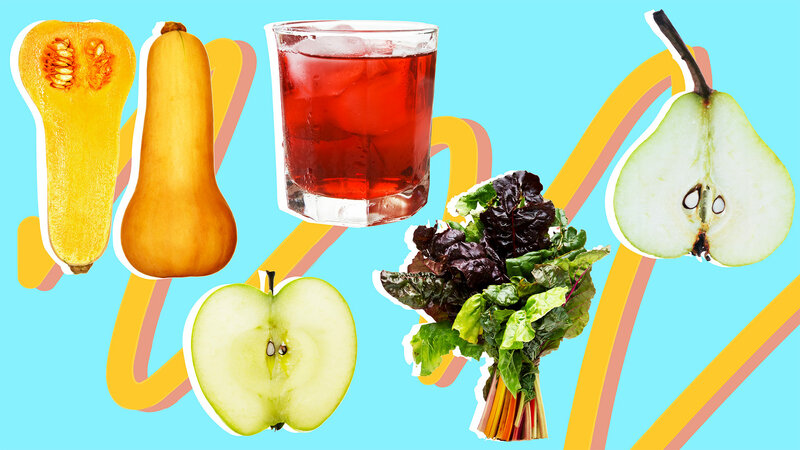 No matter the ages of the children in your life, there’s a fall fruit, vegetable or flavor combination that will satisfy their developing — and sometimes picky — taste buds… or at least give them a welcome break from leftover Halloween candy.